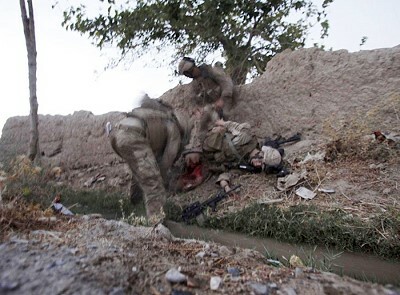 Defense Secretary Robert Gates has condemned the Associated Press decision to release a photograph of a US Marine wounded during a battle in the Helmand province of southern Afghanistan. The Marine, Lance Cpl. Joshua M. Bernard of New Portland, Maine, was struck by a rocket-propelled grenade in a Taliban ambush on Aug. 14. He later died of his wounds. NEW YORK (AP) — The Associated Press is distributing a photo of a Marine fatally wounded in battle, choosing after a period of reflection to make public an image that conveys the grimness of war and the sacrifice of young men and women fighting it. Defense Secretary Robert Gates expressed disappointment Friday at news outlets that used a picture taken and distributed by The Associated Press depicting a U.S. Marine mortally wounded in combat in Afghanistan. Gates wrote a strongly worded letter to AP President and CEO Tom Curley on Thursday, saying it was a matter of “judgment and common decency” not to use the photo. A Pentagon spokesman said Gates followed up with a phone call “begging” Curley not to use it. Gates wrote that use of the photo of a wounded Bernard would mark an “unconscionable departure” from the restraint that most journalists have shown in covering the military since the Sept. 11, 2001 terrorist attacks. The AP did not change its decision. In the US we routinely see pictures of the dead from the other side, including the executed head of the Tamil Tigers,in Sri Lanka, and hundreds of Iraqi and Afghani wounded and dead. I have never read of a single person in the US objecting to that. Then too, the infamous picture of an asassination, at point blank range, of a person in Vietnam, by a North Vietnamese official, supposedly, is still in everyone’s mind, as is the picture of the Vietnamese girl, her clothes ripped away by napalm, running screaming towards the camera. The iconic picture of the small boy, held in the arms of therunning firefighter who tried to save him, blood streaming into the wind at the Oklahoma City bombing, is unforgettable. A new series uses pictures like that. So, the US media has many precedents for this picture. Americans are sensitive about their war dead, and are comfortable showing the horror committed by the “others”. If you ask a parent first, and he asks you not to, you should listen and not publish,or you could have gone on to show the horrors of war, without asking. The picture is not a close-up, as was the case of the dead baby. If we had to see the amputated limb up close, or blood gushing from hi mouth, that would be a different matter. The Associated Press could have simply labelled it a picture of a wounded marine, without adding his name. It is the naming that is painful. This issue is certainly generating a lot of comments in the foreign press. Personally, I think the media was right to publish the picture, even if their motive was to increase circulation (profit), notwithstanding the family’s request not to publish it. It is good that many people get to see the reality of the wars they support. The family’s right to privacy went out the window when their son joined the military. I doubt that Defense Secretary Robert Gates is concerned about the family; he is more likely concerned about more Americans viewing that image and turning against the war. Below is a small sample of online comments about the publication of this picture. Many seem to think that the family’s request to not have the picture published should have been honuored. It’s an utter disgrace that Ms. Jacobson would hide behind journalism freedom to publish photos the surviving family requested to remain private. That’s how she chose to honor him and thank the battalian that was tasked to keep her alive. What’s her real motivation? GREED! How disgraceful. May G-d continue to bless our men and women in uniform. I believe that the posting of a dying Marine is tastless and only used to up sales of a publication. The family requested to not have that photo published and their wishes should have been honored. My brother is a Marine as well as his best friend from high school, who is like a brother to me. One of them will be deploying to Afganistan next month and the other is scheduled for next year. I could not imagine the amout of grief and pain this family is dealing with already and to have their son’s final moments plastered all over newspapers in America can only compound their agony. Every Marine and their families accept the possiblities of them not returning home but it would be unbearable to have my little brothers’ final moments splattered across the US in photos. What a disrespect to the Marine that went to serve you. What if it was your son, brother, father……. Thank you for showing these photos. I have a grandson in Afghanistan. People need to see this. People are gung-ho for war unless you have seen it yourself, which I did in WWII. These young men and women are dying for this country. Lance Cpl. Joshua Bernard served bravely and died bravely. We shouldn’t turn our eyes from his life or his death because his death is in our names, as Americans. Regardless of you stance on the current conflicts. The family asked the photo not to be published. The photo clearly shows the injury and the young Marines face. Would any of the publishing editors, from AP on down, agree to publish a such a clear photo of their loved one dying in a ditch next to a DUI accident? Just goes to show to what levels reports will stoop just to make a buck. Where are the good news stories about the lives our service members touch and change? This is war. As ugly and horrible as it is, this is what war brings. It is very unfortunate that our young men and women are dying in a war that has no meaning. My son will ask me when he gets older; why did we fight in Iraq and Afghanistan and I will tell him no one really knows. May God Bless our Men and Women who serve us proudly. Please bring them home! I have a niece in the US army, a beautiful young woman for whom I pray constantly. Should some harm come to her, I would be horrified to see her wounded, lying on the ground. Should that be the misfortune of this family, I would never read a single newspaper, internet or otherwise, again. Years ago, in TnT, a man fell off his bike, and died on the sidewalk on Abercromby Street, just in front of the old firehouse. I was the first on the scene.When the reporter from the Express wanted to take a picture, I was able to persuade her not to publish, as the family may not have yet known that he was dead. She acceeded to my request. Standards were different in 1987. This reporter went on to make quite a name for herself.I am glad she did not do it on the back of that dead man, who lay in the street for five hours before his body was moved. As I said, standards have changed, regretfully.Incidentally I do not support ANY war, but I respect my niece’s right to sign up. Service men and women are tools for the government. They enlist knowing that they may be sent off to a far away place with a name they may have never heard before or cared to properly pronounce to fight over political issues for which they may not understand. I have no problem with pictures of dead military personnel. I do not believe that an innocent baby should be photographed dead to sell papers and promote an agenda. Paul Craig Roberts [paulcraigroberts@yahoo.com] was Assistant Secretary of the Treasury during President Reagan’s first term. He was Associate Editor of the Wall Street Journal. Well said, Newsday; very well said. I still think that if they asked the father if he minded, and he said yes, they either should not have asked him, or acceeded to his wishes. Nothing you say about the war in Afghanistan is too harsh. Now I want Agence France Presse to go document what the Israelis are doing to the Palestinians, and I want to see, hope to see, and equally tere editorial on that aparthied.